If making time for your self-care is a challenge and pretty much a hit or miss occurrence, remember that a priceless experience awaits you once you’ve made self-care a habit that can help to get you back on track when you’ve strayed. The truth is, even though self-care feels good when we manage to finally give it to ourselves, making it a habit is effort. Perhaps we’re getting up a little earlier then we’d like in order to make time for it. Perhaps we’re taking a pass on staying up late to snack and watch some Netflix because you know you need enough sleep to be ready for your day tomorrow. Thinking about the positive experiences that await us is one way to keep ourselves on track. Today, I’ll share a summarized list of 10 things I’ve found that have helped me keep my self-care promise to myself, rain or shine, through the last 2 decades. This is a big one. Getting clear on the reasons behind you self-care helps to approach it with clarity about its importance. Are you heading towards burnout? Is your body telling you it needs more movement because you sit so much at work? Do you need more sleep to recover from too much activity in your day? Have you received some red flags that something has to change soon? Bare bones honesty about why you want more self-care will help you commit to it when distractions come around. If your reason doesn’t stir any amount of emotion in you, your self-care commitment will be fragile. The reason behind our self-care needs to be connected to our values and what truly matters to us, the lack of emotion stirred is a sign that there needs to be a little more honesty in answering the question why is self-care important to me? The answer to that question needs enough emotion to create conviction from within. It’s that same conviction that will fuel you to get you back on track when you’re derailed. Your why will fuel you when you notice that just stating it out loud empowers you, energizes you and has you stand a little taller. It will inevitably happen. Life presents us with surprises all the time and we have little control over that. Celebrating what went well with your self-care and what pulled you away from it through a journal, helps keep the critical, self-sabotaging thoughts at bay and keeps the intelligent observations and course-correction ideas near. Write down what situations are approaching that you anticipate will derail you because they have in the past. Write detour plans on how you’ll still carry out your self-care even if it’s slightly altered. Take notes on how it went and how you navigated the situation once it arrived. Many times what we think derails us is not it at all, but taking notes keeps us honest and accountable. This may seem simplistic but it works. Writing your self-care time in your calendar in advance helps to see it as an appointment with yourself that is just as important as any work meeting or doctor appointment. Physically seeing that appointment in our schedule whether paper or digital, helps us to protect that time when we’re inevitably asked to use that time slot for other things. It solidifies in your mind that you have a commitment that is just as important if not more than what is being asked of you. Remember what you’re saying yes to, when you need to say no. To make time for your self-care, edit out the things in your schedule that aren’t necessary. Ask yourself what you can delegate, alter, minimize or cancel all together. Weed out from your schedule the activities you regularly say “yes” to that in truth aren’t important or benefit your life in any way. Saying no to the unnecessary, opens the space to say yes to our wellness. The people that don’t understand get upset and distance themselves from you when you begin to make time for yourself, are making it known where your wellbeing stands with them. Keep your commitment and know that changing the way we do things may make others uncomfortable. Those that support your health will stick around, others may be uncomfortable with it at first, but come around later and yet others may just leave. Your environment either supports you or distracts you. Does your home have reminders of the benefits of continued self-care? Do you have self-care supplies within reach so you can easily make that choice when the need arises? The same thing applies for the people in your life. Do you surround yourself with people that have wellness high on their priority list as well? Moral support from people who also practice self-care can make huge difference in your ability to keep up your self-care. Be gentle with yourself and remember that there is a universal process that everyone rides out in creating new habits. 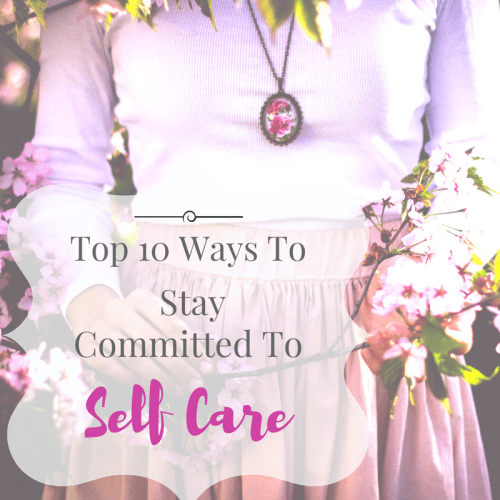 To keep self-care as a commitment essentially means to create self-care habits. The process of doing that entails initial discomfort in re-arranging our lives and it usually takes 90 days minimum to integrate just ONE activity. Not to mention that our needs change depending on the time of year and season of life we’re in, so there is no finish line. The self-care journey is an ongoing editing process of the choices that support us. What helps you stay focused on your self-care goals?